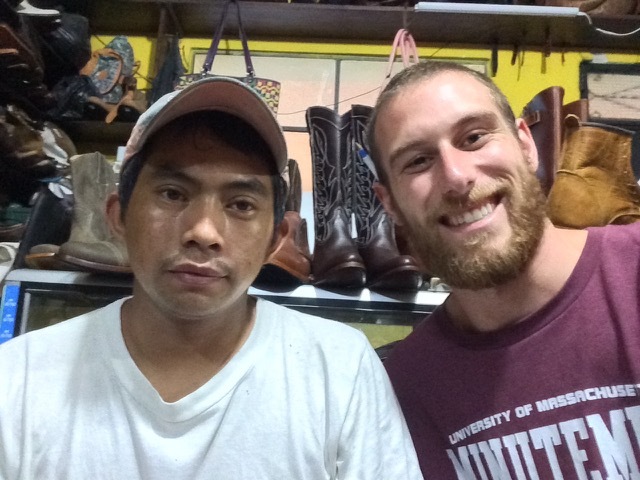 My organizational vision for Adelante Shoe Co. is a US-Guatemalan team in which all are members are equal stakeholders in our social impact goals. The most interesting aspect of my work in Guatemala over the past month has been forging relationships with shoemakers around this vision without making premature promises. It’s a tough line to walk. On one hand, I want to communicate that Adelante is different from a profit-only business and be taken seriously when I do. On the other, I want to avoid making financial promises that I am not yet in a position to keep. These challenges are complicated by societal and generational contexts. Many shoemakers with whom I work are older than me and of Maya decent. Given Guatemala’s history, being indigenous indicates a long history of oppression and impoverishment. I get the sense that they are unaccustomed to working intimately with a “gringo,” and somewhat unfamiliar with the notion that a white person may seek to engage in business for any reason other than personal profit. In the face of these challenges I have placed my faith in the age-old adage that actions speak louder than words. I spend time with the shoemakers each day, asking them about their lives and their families. I talk about my values and my vision for Adelante Shoe Co. when prompted. I communicate as openly as I can about where our business stands and what our next steps are moving forward. Happily, my relationship with each shoemaker has progressed substantially over the last month. Together, I feel as though we have built the foundation of mutual trust and respect necessary for the advancement of Adelante. Ultimately, I get the sense that the shoemakers will allow me the chance to prove my ideas and myself different from the norm. Now it’s up to me to capitalize.